As the PCAST Workgroup ponders the meaning of a Universal Exchange Language and Data Element Access Services (DEAS), it is exploring what it means to exchange data at the "atomic", "molecular", and document level. See Wes Rishel's excellent blog defining these terms. For a sample of my medical record using one definition of an atomic form, see this Microsoft Healthvault screenshot. It's clear to me that if we want to exchange structured data at a level of granularity less than an inpatient/outpatient/ED encounter, we need to think about detailed clinical models to specify the atoms. As I've discussed previously, it would be great if EHRs and PHRs with different internal data models could use middleware to exchange a reasonably consistent representation of a concept like "allergy" over the wire. I think of an allergy as a substance, a precise reaction description, an onset date, a level of certainty, and an observer (a clinician saw you have a severe reaction verses your mother thought you were itchy). PHRs often have two fields - substance and a severe/minor indicator. Any EHR/PHR data exchange without an agreed upon detailed clinical model will lose information. HL7's Reference Information Model (RIM) provides one approach to modeling the data captured in healthcare workflows. However, many clinicians do not find the RIM easily understandable, since it is an abstraction (Act, ActRelationship, Participation, Roles, Entities) rather than a reflection of the way a clinician thinks about clinical documentation. Alternatively, a detailed clinical model provides an archetype or template to define the aspects of the data we should exchange. Stan Huff at Intermountain Healthcare has led much of the work on detailed clinical models in the US. Here's a recent presentation describing his work. To illustrate the way a detailed clinical model can enhance data exchange, here's a description of an allergy template based on collaborative work between Intermountain, Mayo and GE. The Australian work on OpenEHR is another interesting approach to detailed clinical models. It creates a clear expression of a clinical concept in a manner that can be understood both by clinical subject matter experts and technologists. For a given concept, OpenEHR specifies a SNOMED code and then builds the appropriate information structure around it. 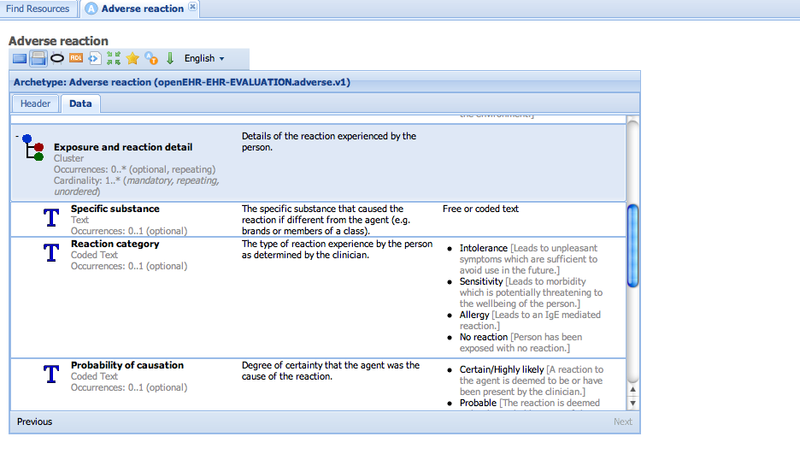 The screen shot above illustrates the OpenEHR archetype for adverse reactions/allergies. William Goossen's ISO 13972 work. He's writing a review of 6 different approaches (see the comment on Keith Boone's blog) including HL7's CDA templates, OpenEHR archetypes, and Stan Huff's detailed clinical models. Hopefully it will be published soon. The UK National Health Service Connecting for Health Project's Logical Record Architecture. The Tolven Open Source Project's Clinical Data Definitions. It's clear to me that wide adoption of a Universal Exchange Language would be accelerated by detailed clinical models. This is a topic to watch closely. Thanks for flagging up the openEHR archetype approach, which is better known outside of the US. It is closely related to the ISO and EU standard en13606 archetype standard. As we know that interplay between clinical process and IT is a key challenge...I was drawn to archetypes several years ago as they have the potential to fit well with the complexity and diversity of clinical process. Given the complexity of the challenge, thanks also for highlighting the diversity of approaches in this space. Over time, as there is much work on detailed clinical models/archetypes to do, greater international collaboration in this challenging space is in all our interests..
A DCM, an Archetype and a template walk up to the bar at a standards meeting. The bartender says: "Don't tell me, triplets". I agree with Barry Smith who says it is time to start over. Let's nip this problem in the bud. The reason it hasn't been adopted is because it is overly complex.